Plain mirror, mirror, on the wall…what’s the best way to de-uglify you? Paint! When we first moved into our new house (which you can read about here, here, and here), I quickly noticed that the previous owners had left us a lot of…uh…”presents.” They left all their hangers in the closets, rusted jewelry on the counters, three boxes of cleaning supplies, old moldy rug scraps, and a pile of dirty diaper trash in the garage. I guess they really wanted their dog to feel the joy of giving, and allowed him to leave lots and lots of presents all over my new backyard. Thanks. Thank you SO much for that. Among the pile of presents, they also left a mirror that they had installed in the master bathroom to replace the standard giant-plate-of-glass one that had been there before. The mirror was certainly not the ugliest I’ve ever seen, but it wasn’t really wowing me either, so I decided that finding a quick makeover idea for it would be best for all involved. 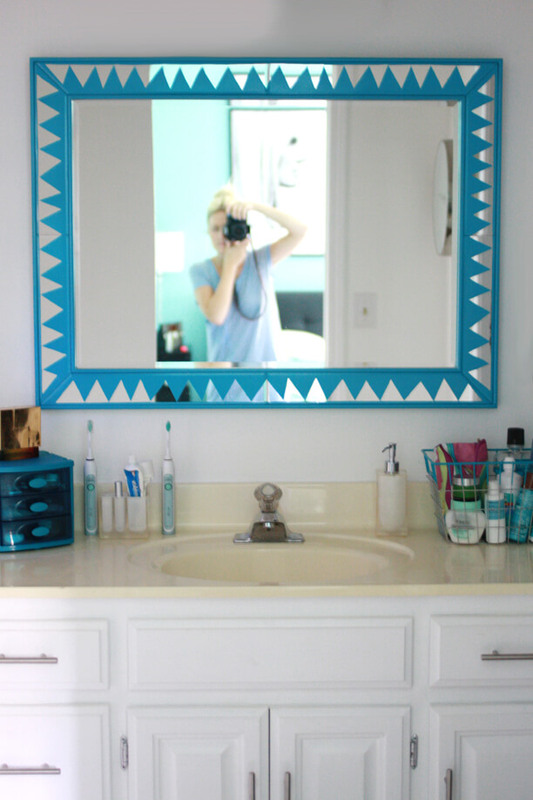 I had rolls and rolls of painters tape sitting around the house since I was in the middle or renovations, so I grabbed a roll and started to cut out triangle pieces and stick them on the outside border of the mirror. 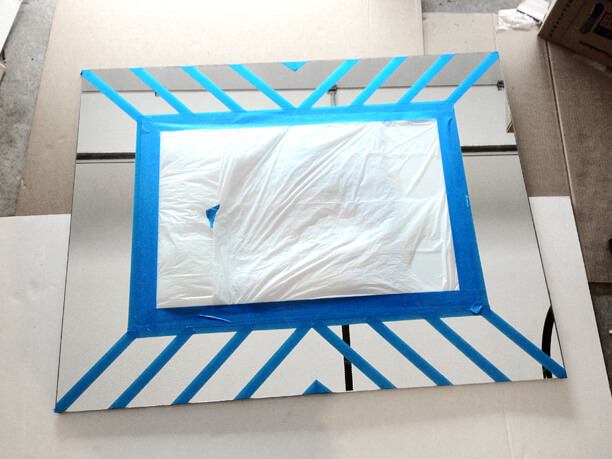 Once I went all the way around the outside edge with my pattern, I taped a trash bag over the center of the mirror so that would remain unpainted when I was finished. Next, I took my chosen spray paint color, and did two light coats of paint, waiting for adequate dry time between coats. Once the paint was dry, all I had to do was carefully peel off the tape, and voilà! The mirror was ready to hang! 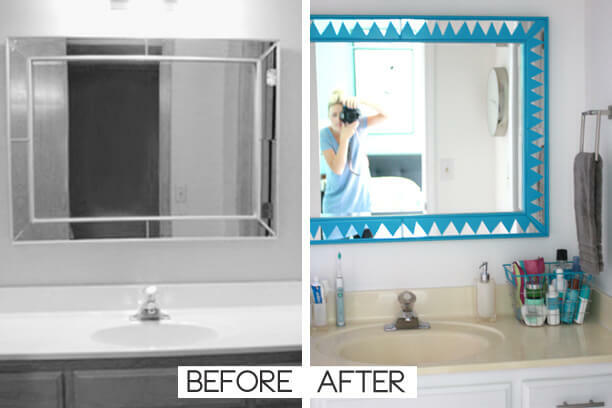 Depending on how complex you want your tape pattern to be, this is a relatively quick and easy mirror makeover and a great way to add a pop of color to any room in the house. Now get out there and find a mirror to paint! Categories: HCYMT? 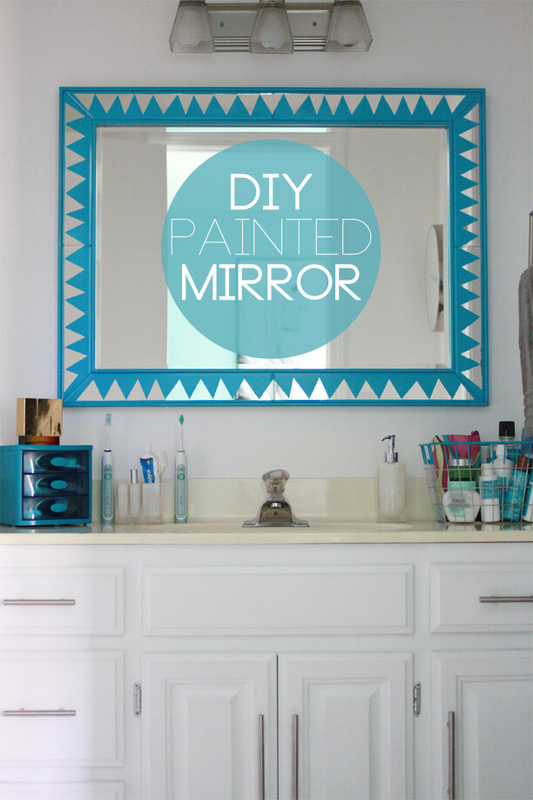 | Tags: diy, painted mirror | July 8, 2013 by thebandwifeblog. love it, its so pretty! Nice! What a great idea and a great result! I’ll have to remember this for the future. Great idea, love the color! Love this idea! So much more fun than the original – and super easy to achieve as well. Awesome project, so simple but really effective. Can’t believe how much crap the owners before had left behind though!